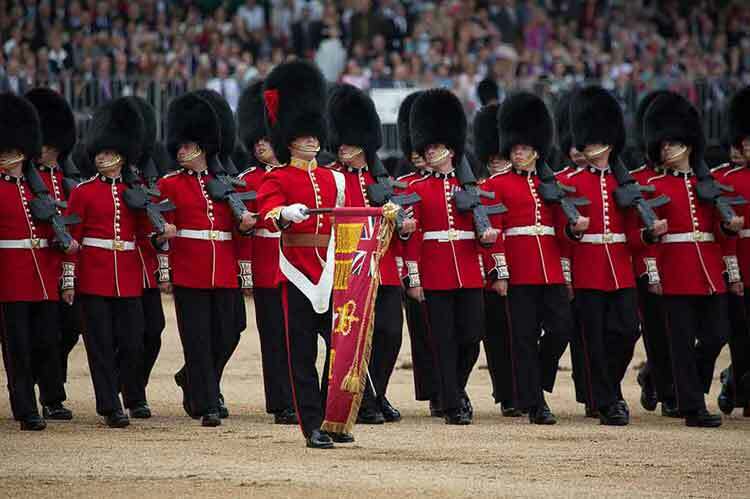 Trooping the Colour, timetable and where to watch The Queen's Birthday Parade without tickets. The timings on this page apply to both the Major General's Review and the Colonel's Review with the exceptions of the Gun Salute, Balcony appearance by the Royal Family, and Fly Past which only take place on The Queen's Birthday Parade. The Queen's Birthday Parade, the highlight of the military ceremonial calendar in London, attracts large crowds, meaning you need to get to The Mall early if you want to get a good spot to watch the proceedings. Troops start forming up, on Horse Guards Parade. Her Majesty The Queen leaves Buckingham Palace in a grand procession escorted by the Household Cavalry. HM The Queen arrives on Horse Guards Parade to take the Royal Salute. The Queen then reviews Her Guards riding slowly down the ranks of foot guards and cavalry in a carriage. During the parade The Colour is Trooped through the ranks before the Foot Guards march past The Queen. Then the Household Cavalry and Kings Troop Royal Horse Artillery rank past. HM The Queen, at the head of Her Guards, returns up The Mall to Buckingham Palace. At the gates of Buckingham Palace HM The Queen dismounts from the carriage and mounts a dais to watch the parade march past in salute. Kings Troop Royal Horse Artillery fire a 41 Gun Salute in The Green Park to celebrate The Queen's Official Birthday. HM The Queen and other members of the Royal Family make a balcony appearance at Buckingham Palace. You can watch the procession from both sides of Mall, marked in red on the map, or from the corner of St James's Park facing Horse Guards Parade. The view from the section marked in orange can be restricted by the troops and horses on parade. Personally I would suggest heading for The Mall, on the St James's Park side, and take up a position close to the junction with Marlborough Road. Wherever you choose you can be sure of seeing one of the finest spectacles in London and having a day out to remember.